Gov. Rick Perry jumped into the 2012 presidential race with a double-barrel blast at President Obama on Saturday, blaming him for the fiscal mess in Washington and promising to make job creation his signature issue. CHARLESTON, S.C. — Gov. Rick Perry jumped into the 2012 presidential race with a double-barrel blast at President Obama on Saturday, blaming the Democrat for the fiscal mess in Washington and promising to make job creation his signature issue. Channeling the angry populism he used in his 2010 re-election campaign, Perry said Obama had adopted "failed western European social values" and was trying to "win the future by selling it off to foreign creditors." "We don't need a president who apologizes for America," Perry said in his speech before the RedState Gathering, a meeting of about 300 conservative bloggers. "We need a president who protects and projects those values." Obama campaign spokesman Ben LaBolt wasted little time responding to Perry. He said the governor's economic policies are a "carbon copy of the economic policies of Washington Republicans." LaBolt said Perry supported the Republican debt plan that he said would have preserved oil and tax breaks while decimating popular programs like Medicare and Social Security. "That's the same approach he took in Texas, where middle class families know his economic record is no miracle — it's a tall tale," LaBolt said. "Governor Perry allowed special interests to write their own rules ... and cut funding for programs that would create opportunity for middle class families." LaBolt said in a GOP field dominated by candidates who are courting the Tea Party, Perry offers "more of the same." Outside the the Francis Marion Hotel where Perry spoke were a few protesters, dressed in Confederate garb, one of them holding a sign that said "Secede NOW." It was a reference to Perry's controversial remarks about the possibility that Texas could secede from the United States. Even before he began speaking, Perry made it official in a news release distributed to reporters. Supporters jammed into a tiny ballroom as Perry addressed the crowd of conservative bloggers, straining the hotel's air-conditioning system. It got so hot at one point that someone fainted right before Perry took to the stage, causing a slight delay in the speech, organizers said. Perry surprised no one by announcing Saturday. It had been telegraphed a week ago and finally confirmed by Perry spokesman Mark Miner on Thursday. Like the "prayer and fasting" event (The Response) in Houston a week ago, the pre-announcment hoopla came off as another PR victory for Perry. He managed to build up momentum heading into the event — while stepping all over what was supposed to be the biggest GOP political story in weeks: the Ames (Iowa) Straw Poll. Another Texan, U.S. Rep. Ron Paul, R-Surfside, campaigned hard to win that nonbinding contest, which could give the winner a boost heading into the nation's first caucus early next year. He ended up coming in second to winner Michele Bachmann. Perry's name didn't appear on the straw poll ballot, but his supporters urged supporters to write in his name, and he ended up getting more votes than Mitt Romney, perceived as the frontrunner in the GOP race. Perry arrives in Iowa Sunday night, and he will be in New Hampshire and back in South Carolina later in the week. Perry's announcement speech was infused with the red-meat conservatism that has made Perry, the longest continuously serving governor in the United States, an icon for many Republican activists. He talked about Obama's "unbridled fixation" with raising taxes and "giving it to a central government." Stripping away any nuance or pleasantries, Perry — who prayed for Obama last week — said the president's appointees were a "threat" to America and said it's time to fire the Democratic incumbent. "Page one of any economic plan to get America working is to give a pink slip to the current resident in the White House," Perry said. He also said the president's "spend-and-borrow agenda" had created the first downgrade in the U.S. credit rating. "This sure doesn't feel like a recovery," Perry said in a mocking tone, poking at Obama's contention that things are beginning to get better. "This is just the most recent downgrade," he said. "The fact is that for nearly three years, President Obama has been downgrading American jobs, he's been downgrading our standing in the world, he's downgrading our financial stability, he's been downgrading confidence, and downgrading the hope for a better future for our children." Perry positioned himself as an aggressive hawk on foreign policy. He said America's involvement abroad had become an "incoherent muddle" and said vowed to punish any foe. "Those who threaten our interests, harm our citizens, we will simply not be scolding them," Perry said. "We will defeat you." 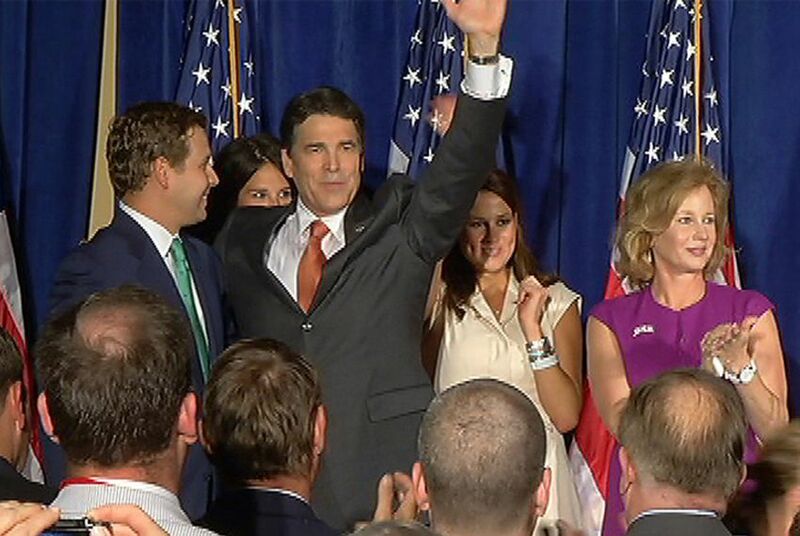 Perry was near the middle of his remarks before he even got to the whole point of his speech — that he's in the race. "It is time to get America working again," Perry said after going through a litany of attacks on Obama. "That why, with the support of my family, and an unwavering belief in the goodness of America, I declare to you today my as a candidate for president of the United States." The governor had spoken to the group in Austin last year and had agreed back in August 2010 to appear here in South Carolina, long before he had started strongly hinting he would run for president, organizers said. He had been scheduled to take questions, as other politicians do when appearing before the group, but that didn't happen Saturday. The Texas governor was clearly well received and the event was packed. Erick Erickson, editor of the RedState blog that sponsored the gathering, said it was by far the group's most successful and well-attended convention. Before it became clear Perry would announce for president, 300 had signed up to attend. By the time Perry took the stage, more than 700 had shown up. But the bloggers who attended are sophisticated voters who follow politics closely and there were some who left unconvinced that Perry is one of them. His support for allowing certain illegal immigrants to get in-state tuition while attending college seems to be the biggest issue cited by critics on the right. Sheri Irwin, attending her first RedState Gathering, also cited Perry's support of the now-dead Trans-Texas Corridor, criticized as a government land grab by opponents. “From what I’ve heard he’s for in-state tuition for illegals, and this eminent domain thing with that superhighway," Irwin said. "That's a non-starter for me." Irwin said only Bachmann, who will appear at the same Iowa event Perry is speaking at Sunday night, gets high marks on the illegal immigration issue. Irwin said people who aren't in the United States legally "need to go home. Republican U.S. Senate candidate Ted Cruz, supported by the influential RedState blogger convention, helped fire up the crowd for Perry a couple of hours before the governor spoke. Cruz said the race would come down to a fight between Perry and former Mass. Gov. Mitt Romney.